This is a fun mistake, via Jonathan Newman. Find it, and then explain how you’d help the kid who made it. Posted in Trig Identities, Trigonometric Functions. "1 + 1 = 1 ????" "How do we get kids to stop and think when the cognitive load is higher?" 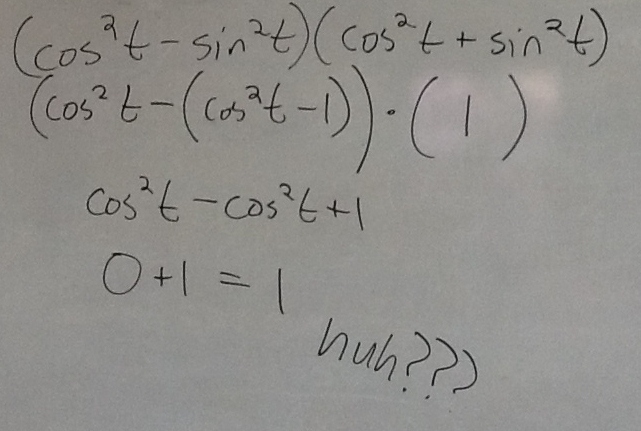 If sin(x)/cos(x) = 3/5, then 1/cos(x) = 1/5. You ready for some more trig identities?